Heading into Newcastle today for a much-needed haircut, I had my usual wander around to see what was happening, retail property-wise. 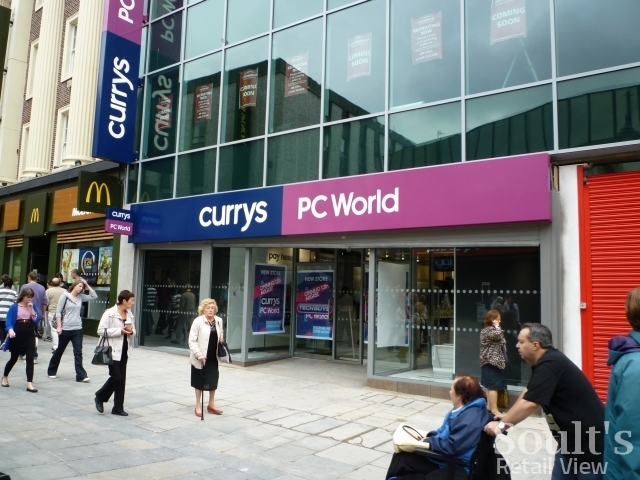 In Northumberland Street, the new combined Currys and PC World now boasts its signage ahead of its opening on Thursday (12 August). Upstairs, the new branch of Cotswold Outdoor – accessed from the street via the entrance with the red shutters – looks to be less advanced (with no signage yet), and merely declares that it will be ‘coming soon’. There’s no further opening information, that I can see, on the retailer’s website, though I fairly quickly got fed up of trying to browse the site due to its heavy use of Flash and constant ‘Loading’ messages. Overall, the revamped property is certainly more pleasing to the eye than it was as Currys.digital, though I never understand whose idea it is to populate the city’s premier shopping street with tatty market stalls. 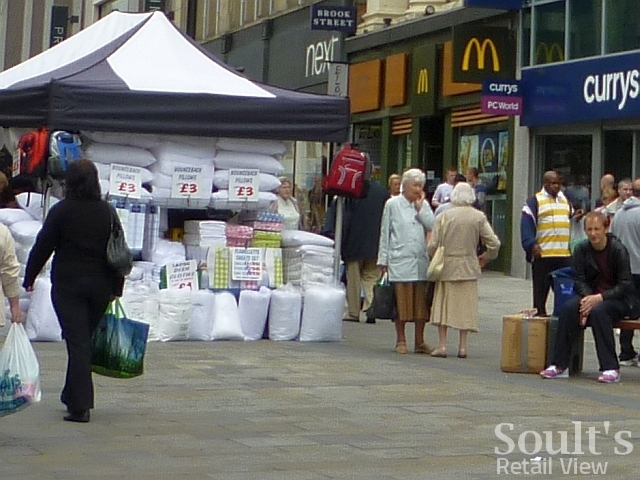 If I’d just invested a lot of money in modernising my store’s frontage, the last thing I’d want is to be partly obscured by a stall selling £3 pillows. 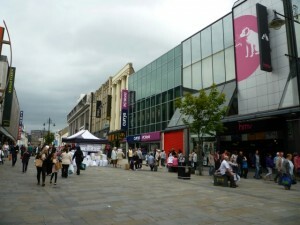 One place where market stalls are less out of place – if any actually wanted to locate there – is the Green Market at High Friars, in Eldon Square. The news of the market’s closure – broken here in January – has now been confirmed, with on-site notices on Newcastle City Council letterheads giving a closure date of 31 January 2011. It will therefore be a little while yet before any work can start on the replacement three-storey retail unit that is still rumoured to be earmarked for Urban Outfitters. The notice indicates, incidentally, that tenants will be offered alternative space in the Grainger Market; one suspects, however, that those stallholders who wanted to go there would have already done so when the previous Greenmarket, facing Clayton Street, was closed in January 2007. Finally, at the other end of Eldon Square, the St Andrew’s Way-initiated retail merry-go-round continues. 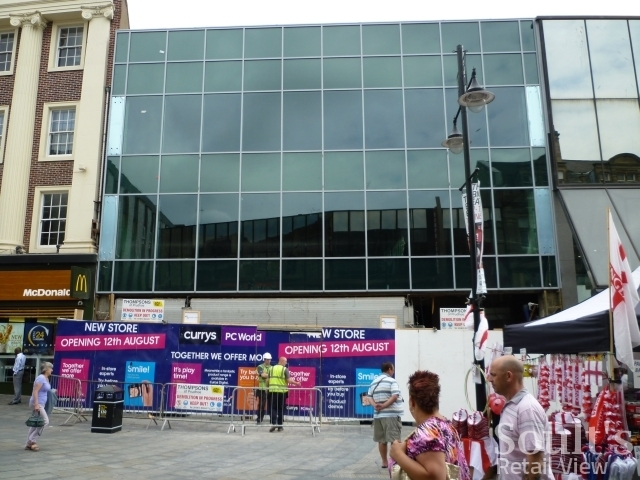 Clinton Cards is set to move into the Douglas Way unit vacated by River Island, with a shop that will include one of its Pure Party concessions. 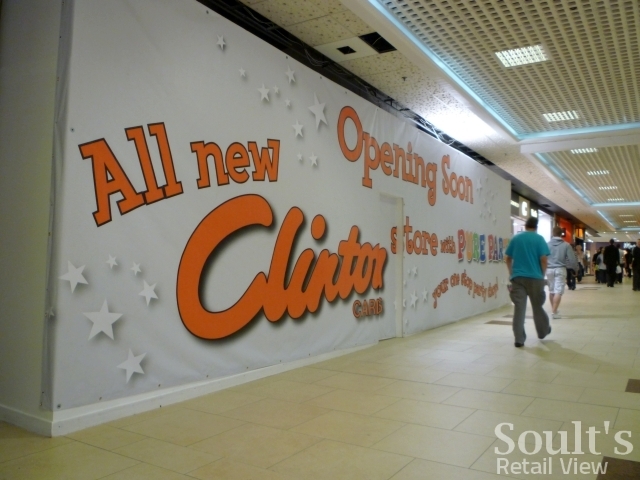 One imagines, in turn, that Clinton’s existing Eldon Square store at 14-16 Blackettbridge will be closed. Selling partywear, costumes and balloons, and first launched as a trial in late 2009, Pure Party seems like Clinton’s attempt to mop up some of the business that would previously have gone to Woolworths. The fact that Clinton’s is continuing to roll out the concept – with 43 standalone or concession stores so far – suggests that this strategy is proving a success. 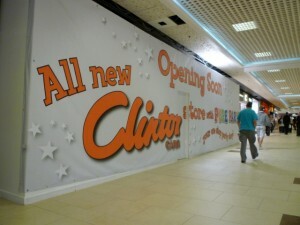 My shot of the Clinton’s hoardings may, incidentally, be the first and last photo I take inside Eldon Square. I was promptly spoken to (pleasantly but firmly) by a security guard who warned me that “no pictures of any kind” were allowed within the mall. I never quite understand why shopping centres are so tetchy about photographs, and Eldon Square – unlike others I’ve visited – does not seem to have any signs at its entrances expressly banning the practice. Still, I’d better not do it again. 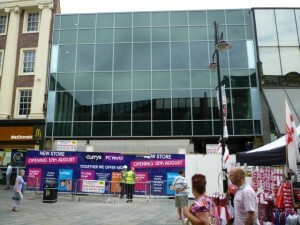 I have taken a few pics in Eldon Square, but the last time I did I was told the same thing. I find it incredibly annoying as I can’t think of a single good reason. At least the person who told me photos were forbidden in ES was more polite than the person who told me I couldn’t take pictures in the post office on St Mary’s Place (it was when they had the football flags and balloons up).